Native and Roman on the Northern Frontier presents the definitive report of a programme of excavation and survey at two sites south of Eskdalemuir, in the valley of the River White Esk, Dumfriesshire, which have wide-ranging implications for the study of the Iron Age and Roman frontiers. Over two years a small-scale intervention at the Castle O’er hillfort and the total excavation of a unique enclosure at Over Rig were carried out, the results of which are brought together and documented in detail for the first time in this volume. In the isolation of Upper Eskdale in Dumfriesshire archaeological remains dating from the Neolithic to the medieval period have survived in relatively good condition. A sequence of surveys and studies has shown an active Neolithic ceremonial focus, with great standing stone delineated settings and a kilometre-long bank barrow, Bronze Age cairns and cists, and an Iron Age hillfort known as Castle O’er, from which the area takes its name. The hillfort lies at the heart of a complex pattern of linear earthworks that appears to be designed for the containment and control of animals. Associated with this complex was a further semi-circular, multi-embanked site built on the verge of the immediate cliff-like descent to the River White Esk which could be allotted no clear function or parallel type. This enclosure was known by the local name Over Rig. Fearful that Over Rig was in danger of erosion by the river, it was chosen for excavation by Historic Scotland and excavated by a team from the University of Edinburgh. The team decided to investigate the hillfort at the same time in an attempt to tie together all of the Iron Age components and better understand the ancient landscape of the period. An appraisal of the sequence of development at Castle O’er hillfort revealed that the site’s occupation reaches back to at least the middle of the first millennium bc, when a densely nucleated settlement was probably set within a high, defensive wooden palisade containing a number of great 12-metre-diameter roundhouses aligned along a levelled central roadway. Occupation continued until about 200 bc, although the palisade was replaced at some point by a massive bank and ditch. At that date the fort itself may have fallen out of use as the landscape was being opened up by massive tree-clearance. Small farmsteads – terraced into the hillside and simply defended – appeared at relatively even intervals along the valley bottoms of the Esk and its tributaries. Evidence gained from fossil pollens suggests that at this time the haughs of the rivers may have produced barley crops, and maybe protected woodland, while the hill-land behind was given over to sheep and cattle, thereby establishing a relatively prosperous farming landscape. From early in the first century ad it seems likely that the construction of the outer complex of linear earthworks was added to earthwork annexes already built onto the old hillfort. Such a complex could have served to enclose herds of cattle and possibly horses – both of which we know were husbanded in Iron Age societies in Scotland, perhaps as tribute to rulers. This facility would take on new relevance as by about 70 ad, some 30 years after their appearance in Britain, Roman forces had reached the Solway-Tyne line, which for a time became an effective frontier with a sizeable garrison. By the early 80s Agricola had embarked on his extraordinary adventure 300km to the north and must have felt secure in undertaking such long-range penetration. By the 120s AD Hadrian’s Wall was under construction and Roman writers tell us some basic details of the ration allowances for their soldiers. We also now have a good idea of the number of units and troops stationed on the Wall and its associated forts. It is therefore a fairly straightforward calculation to determine the demand the Roman army made on the local economy. For the western part of the Wall, some 3,500 cattle would have been required per annum and probably as many as 800 ponies for cavalry remounts. Agricola’s sense of security indicates a peaceful population around his lines of communication and a reliable supply of provisions, strongly suggesting a relatively peaceful take-over and the agreement of protocols and relations between Roman forces and at least the proximate ‘Scottish’ natives. During the period of Roman presence the Over Rig enclosure was built in a dell beside the Esk. Excavation suggests that this unique site has a ceremonial function which is likely to have taken advantage of the site’s extraordinary acoustic qualities. In effect it was an amphitheatre, unknown elsewhere in Iron Age Britain and possibly influenced by Roman presence or drawn from Irish parallels. The old hillfort was finally reoccupied, probably after the decrease of Roman influence in the area, its interior surrounded by a wall which was at least partly laced with timber. This fort was attacked at least twice and on one occasion, probably in the fifth or sixth century ad, the south-west gate was burned. At this time there was a minor decline in the availability of grassland for grazing, however upland grazing for sheep and cattle continued, through the supremacy of the monastic regime at Melrose who controlled the Eskdale estate, until hill farming was replaced by recent afforestation. The excavations at Castle O’er and Over Rig have thus created and clarified the use of the upper Esk valley over a period of 5,000 years. 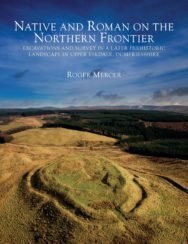 Native and Roman on the Northern Frontier: Excavations and Survey in a Later Prehistoric Landscape in Upper Eskdale, Dumfriesshire by Roger Mercer is available now, published by the Society of Antiquaries of Scotland (RRP £30). The book can be ordered online via the Society’s website.